< p>In the New Testament for Everyone series, Wright continues his trademark of bringing the most up-to-date biblical scholarship to life with engaging writing, inspiring anecdotes, and faithful interpretation. 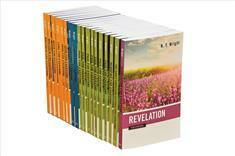 These eighteen volumes are ideal for Bible study, personal devotion, and teaching. N. T. Wright talks about the New Testament for Everyone series on WJK Radio with Dan and Jana. To listen, click here.